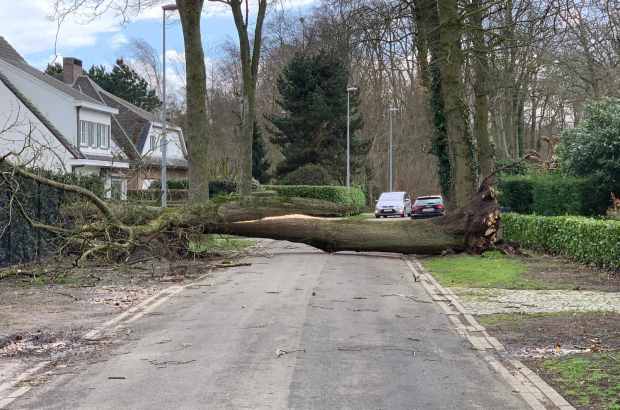 Brussels' parks and woods will remain closed on Monday after violent winds gusting up to 110kph caused damage across Belgium, killing a man in Flanders. The man died in Mol, Antwerp province, when he was hit by a falling tree. Firefighters in Brussels were called out hundreds of times to reports of damage and carnival parades in Dendermonde and Montaigu-Zichem were cancelled. A security perimeter was put up around Docks Bruxsel shopping centre after part of the roof detached and fell on to the street below. A petrol station roof in Molenbeek was also blown away. Stib buses in downtown Brussels were diverted following reports of tiles falling from a roof. Tram services in Tervuren were also disrupted by fallen trees. Part of the A12 motorway and the Brussels ring near Waterloo were closed briefly because of trees on the road. Engineers are working overnight on the SNCB rail line from Bruges to Knokke, where overhead power lines have come down. Antwerp and Planckendael zoos were closed to ensure the safety of visitors and animals. Brussels Environment said the region's green spaces would only reopen after a full inspection and clean-up of debris. The Bois de la Cambre will be closed until at least Tuesday. The weather will remain unsettled over the coming days. Further showers are forecast for Monday and the Royal Meteorological Institute is expecting gusts between 60 and 90kph until Wednesday.